The opening chorale from the Sweet Time Suite (called just “Opening”) is one of those immaculately constructed pieces of music that instantly draws you into its world. It’s just so purely beautiful and arrestingly memorable, and it makes for the perfect introduction to the larger suite — it’s impossible to not want to hear what comes next. As the first track on Music for Small and Large Ensembles, it’s often a gateway drug for people who have not previously encountered Kenny Wheeler’s music. The Monday after Kenny died, I used this piece to begin the first day of the composition workshop I was leading in Copenhagen. Many of the students hadn’t heard it before, so I’m glad to have been able to introduce them to such a powerful piece of writing, one which has certainly been a formative influence for me. I have vivid memories of the first time I sat down with the score to “Opening” to try to figure out what was going on. I was stunned to discover that such a beautiful piece turned out to break so many of the compositional and arranging rules our college teachers had been trying to drill into us! It was an early and important lesson: pretty music is often much more complex than it sounds. The first time through the chorale, it’s played unaccompanied by the saxophone section, with soprano sax lead. However, the addition of Norma Winstone’s wordless voice doubling the soprano sax melody is key: she instantly removes us from the realm of classic big band and places us in a wholly different sonic space. Of course, big band composers have been using wordless vocals since even before Ellington’s “Creole Love Call,” but as far as I know, Kenny was the first to use the voice as an instrumental color inside his large ensembles on a routine basis. The way Kenny used Norma’s voice has informed many subsequent composers, including Maria Schneider and John Hollenbeck. The first two sonorities suggest a kind of V-I resolution, but one that is rather alien to jazz: the V is not the usual V7, but a V triad that also contains the suspended 4th — or, alternately, you could call it a sus4 triad with the added 3rd. Adding the third on top of a sus4 chord became the hip thing to do in the mid-1960’s, but these chords were almost invariably voiced with a dominant 7th — often an 9th and/or a 13th as well. This is much more stark: a simple triad, but with the 4th added a major seventh below the 3rd. It resolves to something that sounds like GbMA9, but it’s missing the third, the one chord tone which is usually considered essential to any major-sounding sonority! We still hear the second chord as a MA9 type of sound, but the missing third gives it a more ambiguous, ethereal character. The chorale then proceeds in an additive fashion: the first two chords are repeated verbatim, followed by two additional chords, which turn out to be literal transpositions of the first two: the same sequence up a perfect fifth. The additive process begun here will continue, as each new phrase restates the previous one before going on. In the third phrase, after the repetition of the first four chords, we hear our first “complete” jazz chord: an Ebm9 voiced with the root in the melody and the minor 3rd and the 9th grinding against each other. This melody note (Eb) completes a pentatonic scale in the melody, and while our key is still ambiguous, based on the pentatonic melody we might begin to suspect that we might be heading for Db major, which would make this Ebm9 a II chord. After that, we might be expecting some kind of V chord, but instead we get AMA7(#11), with some lovely inner movement: there’s a voice exchange in the alto sax and first tenor (from the 3rd up to the #11 and from the #11 down to the third, respectively) and from the 7th down to the 6th in the second tenor. You could also view the AMA7(#11) as an a first-inversion F7alt. voicing, without the F. It amounts to the same thing, a sonority with strong chromatic voice-leading pulling us towards the arrival chord on the third beat of the third measure: a Bbm triad with an added 9th. However, this is voiced not with the 9th adjacent to the minor 3rd (as in the Ebm9 chord on the second beat) but with an exposed minor 9th between the alto sax and the first tenor. The interval of a minor 9th between inner voices or below the melody is considered extremely dissonant. Mainstream jazz composers and arrangers have traditionally avoided it at all costs. Adventurous writers like Billy Strayhorn, Gil Evans, and Bob Brookmeyer found colorful ways to use this interval, but this usually involved foregrounding the dissonance, exploiting it for its unsettling effect. But here, Kenny resolves to this Bbm(add9) chord, which contains a very prominent minor 9th, and makes it sound beautiful and inevitable, thanks to the seamless voice-leading that precedes it. This pretty much blew my mind when I first realized what was going on — I didn’t know it was possible to make a chord containing a minor 9th sound so sweet and pretty! The fourth phrase (which begins on the second beat of m.4), retraces our steps through all of the above and continues onward past the minor-ninth-containing Bbm(add9) chord to another chord with a minor 9th, a Cm9 with the 3rd (Eb) in the melody and the 9th (D) in the first tenor. And then, at then end of this phrase, we settle on a third minor 9th-containing chord, a DbMA9/F with the root (Db) in the melody and the major 7th (C) in the second tenor. This is a really remarkable sequence: we have minor ninths on three consecutive chords, between three different pairs of instruments, but each time they feel completely logical and elegant, drawing no particular attention to themselves. Somehow, Kenny has made the dissonance vanish! I should also mention that this DbMA9/F chord is the first tonic chord we’ve gotten so far… though the fact that it appears in first inversion, plus the strong C to F motion in the baritone sax, both conspire to disguise this fact. In fact, at this point, it probably feels more like we are in Bb minor than Db major. It’s probably also worth mentioning that the last three chords of this phrase are harmonized with consecutive parallel fifths between the second tenor and the bari sax — while in jazz, parallel fifths aren’t the bête noire they are in classical harmony, in an exposed chorale texture like this, including several parallel fifths in a row in the lowest pair of voices does tend to undermine the feeling of independent voice-leading. But somehow, Kenny’s harmonic sleight-of-hand ensures we don’t really notice them. The fifth phrase, beginning on beat 4 of m.5, again recapitulates everything we’ve previously heard before continuing the journey. The phrase is extended by proceeding through a GbMA(#11)-type chord — though again, the third is absent — to an Ao7 with an added Ab in the top voice, before settling on the downbeat of m.7 with a tight Bbm voicing which also contains an added 9th and 11th. In fact, what we have here is a compact “chord” comprised of the first five notes of the Bb minor scale. A tight modal cluster like this is not supposed to sound so pretty, or so stable! But the logic of the melodic line, plus the inclusion of Winstone’s voice doubling the soprano sax, helps to keep the melody clear despite this ultra-crowded voicing. The next phrase is the first to not recapitulate all that has come before. Instead, we start with the three chords that were added to complete previous phrase, and then add two more: an Fm11 chord in the classic “So What” structure (three stacked 4ths with a major third on top) followed by a GbMA13 chord with the third in the melody — the first major chord thus far to actually contain a major third! Also note the voice-crossing between the first and second tenors, done to avoid what would otherwise would have been an awkward repeated note in the first tenor. This phrase becomes our new starting point as we once again begin the additive process, building on what came before. The next phrase, beginning on beat 4 of m.8, repeats the first five chords from the previous phrase, followed by a stark Absus (with only the the root, 4th, and 5th). After that, we proceed to our first root-position dominant seventh, an F7(b13, b9), which passes through Adim.7 (with the Eb raised to F), before resolving to another clustery Bbm triad with an added 9th and 11th. This time, though, the root and fifth are in the two lowest voices, giving it a darker hue. Again, you’d be forgiven at this point for believing that the whole thing has been in Bb minor! For the next phrase — the longest in the opening chorale — our starting point shifts again: we pick up from the last four chords of the previous phrase before pivoting into a stunning new progression, one that also manages to encapsulate the entire chorale in a single phrase. After the Bbm(add 9, 11) chord, we return to the same Dbsus(add3) sonority we opened with, followed by: a stack of fourths suggesting Cm7(b6), an incomplete (third-less) CbMA13(#11) chord, a fourth-y Bbm11 voicing, and then a widely-spaced Ab7sus. From there it’s up to AMA13(#11) leading us to yet another minor-9th-inclusive Bbm(add9). You may also have noticed that the melody in this measure (m.11) is, from the second eighth note onwards, identical to the third phrase of the chorale, but displaced so that on-beats become off-beats and vice versa. Also, the AMA13(#11) – Bbm(add9) progression at the end of the measure is similar to, but not quite the same as, the voicings that conclude the third phrase. The next measure (m.12) continues the chromatically-ascending bass line with a beautifully-voiced CbMA9 (with the 9th down in the second tenor), then a dark quartal voicing that produces a C-7(b13, b9) sonority, followed by a tight DbMA13 chord — the first complete, root-position tonic chord in the piece! We don’t rest here long, though: instead, the bari sax plunges down a fifth, as it did in the opening phrase, and we get an uncomplicated GbMA7 chord, albeit one that is closely related to the second chord of the chorale — only the top voice is different, a 3rd instead of a 9th. This GbMA7 resolves downwards and we come to rest on an Fm9, which — as you probably guessed — contains a minor ninth interval. However, this one (between the melody’s Ab and the second tenor’s G) is lower in register than any of the others and gives a darker, grittier sound. Now, in m.13, we get the only phrase in the chorale that does not begin by recapitulating part or all of the previous phrase. Melodically, this stepwise descent echoes the stepwise descending figure introduced in m.9, but it creates a greater sense of finality as it actually reaches the Db tonic. But the harmonic progression delays the final resolution, leading from a quartal Ebm11/Bb to an Ab13sus(b9) — a chord borrowed from IV minor — up through another AMA13(#11) voicing (note again the voice-crossing to avoid repeated notes) to settle on Bbm9, with the ninth adjacent to the melodic third. This is another one of those things you are really not supposed to do in traditional arranging: land on a voicing with a half-step grind between the melody and the next-lowest voice. You can sometimes get away with this if the lower voice is merely suspended, and then steps away from the melody, but here, Kenny just sits there happily with a dissonant semitone on top, trusting that the melodic logic of that stepwise descent will draw attention away from the half-step clash. 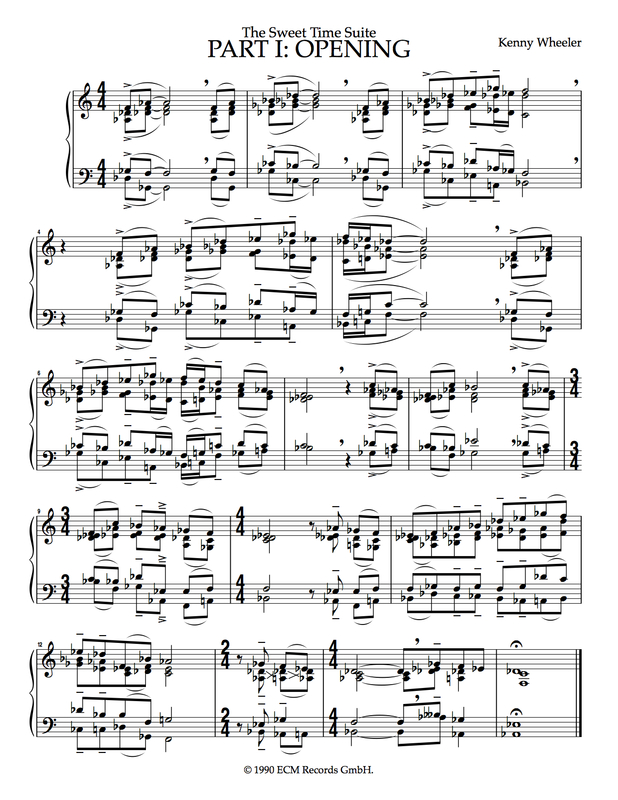 The final phrase is melodically identical to the previous one, but the harmonic progression is not: after all this time, we finally get something close to a V-I cadence. The V is the Ab13sus(b9) chord from the previous phrase, first in a compact, closed voicing, before the bari sax drops down an octave to open it up. And then — finally, in the last bar of the chorale — we come to rest on the tonic chord, DbMA9, for the very first time. However, it’s voiced with the dominant in the lowest voice (making it DbMA9/Ab) and also brings back that dissonant minor second grind between the top two voices. So even our long-awaited V-I cadence comes with an undercurrent of unresolvedness and dissonance. The chorale then repeats, this time with the entire ensemble joining in, including Dave Holland and Peter Erskine. There a a few subtle changes the second time around: the original five voices are doubled in the brass but a new, sixth voice is also introduced, played by the third trombone. However, even with six voices, Kenny is careful to avoid completing strategically incomplete chords. The addition of Holland’s bass also changes things a bit — while he mostly doubles the baritone sax voice an octave below, there are a few spots where he plays something a bit different, which affects how we perceive the harmonic progression. For instance, in the first measure, he does not double the bari sax’s Db-Gb descending fifth — instead, he just plays Gb at the beginning of the measure, making both chords feel like GbMA9 chords with the third omitted. (The same thing happens up a fourth in the second measure.) Also, some chords that were used in inverted versions during the first pass become root position chords on the repeat — most importantly the DbMA9 chord in the final measure, where Dave Holland’s big fat Db at the bottom gives us (finally) a proper V-I cadence. The addition of bass and drums also makes the barlines more relevant — if you were just transcribing the unaccompanied saxophone chorale, your instinct would probably be to notate it as a measure of 3/4, followed by a measure of 4/4, followed by a measure of 6/4, etc., so that the beginning of each phrase coincides with beat one. But the entry of the rhythm section on the repeat allows us hear the melody, as it is written, with the phrases displaced and beginning in different parts of the measure. “Opening” is also “Closing,” the eighth and final part of the Sweet Time Suite. It comes after a lengthly unaccompanied flugelhorn cadenza by KW, and his improvisation carries forward into the recapitulation of the chorale, where it becomes a kind of call-and-response between Kenny and the band. It’s a genuinely ecstatic moment, after all of the emotional territory charted over the course of the 50-minute suite — I especially love Kenny’s bold note choices over the final chord! Darcy James Argue and Secret Society website.